As of the time of posting this, I will be entering the classroom at the Cartier Suites Hotel in Ottawa, Canada to teach the spring session of the Master Certification Module; a seven-month course that completes the whole of our Integral Coaching® Certification Program. For my own preparation, there’s the practical stuff like packing reasonable shoes and all the up-to-date materials. There’s the ritual of wrapping my metal singing bowl that’s used to signal the start of each session as the final packed artifact that lets me know I’m ready to leave for the airport. There’s steadying my own personal practices and waking up at 3am to get adjusted to Eastern time. These rituals are on behalf of being as grounded, rested, and available as possible to hold the container and meet the students. But the best part of my prep, the part that truly drops me into the sweet ache of what it means to be a human being, is reading through and taking in each student’s pre-course work. In this, they give language to their life and development, the here and now as well as the emerging future that this course is in service of. What’s incredible is the caliber and quality of the work brought by our students at this level: the self-awareness, the vulnerability, and the strength of embodiment of what each human being has in them. Real, risky, all on the table, intimate papers about who they are and what they long for. Connecting me to the human spirit more than any book I could read, absorbing these student writings before we arrive in the classroom and launch into a seven-month journey together is deeply inspiring. Some students I know well and had coached before their first module of training with us. Others I’m getting to know for the first time through their written words on the page. Being present to where they’re at, what they’re longing for, what their capacities are, and where they want to develop in service of taking this work out into the world is a ritual for me that feels like a devotional act on behalf of our collective art as servants of change. One of the things I’ve been reflecting on while we approach this class is the concept of Self-As-Instrument. What it means to develop one’s capacities to be an instrument of change. This term is used often in developmental circles and, as a concept, can be readily inspiring; particularly for those who are called to make a difference, to develop themselves and support the development of others, and ultimately enable meaningful change to occur in their circles of concern and influence. But change isn’t easy or straightforward; be it in personally developing oneself, holding others in their development, or attempting to carry out initiatives in work and life. It’s these three streams – personal development, holding the development of others, and enacting impact – that I’ve noticed make a tremendous difference for people in roles of supporting change and developing their own Self-As-Instrument. It’s this intersection of self, other, and world that enables change to occur and ripple, and these three streams also build upon and reinforce the others as they’re developed. Similarly, they’ll all become diminished this when one of them is ignored or unattended to. With these times we’re in, our world is radically complex. It’s changing rapidly and is calling for something from us that’s not quite clear. So many of us are seeking to create change, for ourselves, our communities and the world. 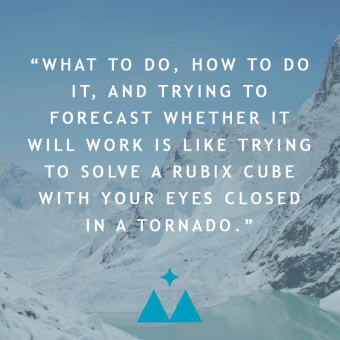 But what to do, how to do it, and trying to forecast whether it will work is like trying to solve a Rubix cube with your eyes closed in a tornado. Gone are the days when straight ambition and laid path formula-following will get a job done and turn a person out. So are the notions that one’s own personal practice and reaching individual enlightenment is worthy pursuit without rippling that wisdom and contribution back down the mountain. Simply discerning what move to make that doesn’t lead to more distraction and the perpetuation of one’s suffering is surprisingly difficult for many these days. For those called to make a difference, we need to be continually tuning our own instrument, working the edges of our development such that we can resiliently respond to life; staying open, soft and receptive to what is right here while having the courage and strength to meet and face what is called for. This is what excites me so much about stepping into the classroom: the opportunity to open to, receive, and dynamically work with a group of awake and dedicated people embarking on the journey of coming home to themselves, enabling transformation in others all while launching projects that are dear to them out into our hungry world. In our first level of coach training, the Associate Certification Module, most students experience profound personal shifts while also working with the basics of what is a very rigorous coaching method and training. As practice and integration occurs in the second level of the program, our Professional Certification Module, an individual’s capacities as a coach and skillful human increase. The receptive container and embodied capacity of the coach is strengthened to do deeper and more nuanced work. The third level, the seven-month Master Certification Module, introduces a project component in addition to the student’s client work and his or her dive into intensive personal development. This is the module where the art and play of this work really comes alive. This project is an opportunity for students to take their work out into the world with their own unique expression, developing their voice and capabilities to tangibly manifest an offering of value. Sometimes these projects are related to building their businesses or enacting something within their organizations. Other times they’re rooted in community or creative expression. What’s key about these projects is that students are asked to attempt to execute on something meaningful while in the midst of the disruptive pursuit of deep development. At the same time, they’re also in the role of holding the development of their clients as well. In a world that often sells the illusion that we need to have all the answers; be perfect, put together and reach a high level of expertise or authority before we can truly make a difference, have value and offer our contributions to the world; I long to be a champion for the messy, partial, in progress humans that we all are. We’re whole. And we’re flawed. Both. And. There’s always more that can be done, developed, deepened. And starting right where we are is valid and enough. So the question then to be living is perhaps this: Where am I now that I can start from? And what is the world waiting for that only I can meet? It’s this that I return to as I enter dojo of the classroom again this week. Tuning and developing Self-As-Instrument – be it trumpet of change, scalpel of transformation, vessel of receptivity, or space of presence – tuning our instruments to a point of ultimate satisfaction is a set of practices that will take a lifetime or longer. But, for those who are called to a path of service and see it both stretched out behind them and what still beckons, the world requires and needs our instruments. Whatever level of skill we are at is enough to meet it, and it’s through this practice of using ourselves as instrument in the best way we possibly can that we learn, grow, sharpen, open, and expand.